The movie "Fight for Space," currently a project on kickstarter, explores the idea that NASA cannot get humans to Mars in the 2030s. NASA cannot put astronauts on Mars in the 2030s under current funding, experts interviewed for an unreleased movie say. 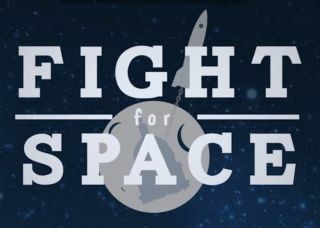 The makers of the film, called "Fight For Space," are currently raising funds via crowdsourcing on Kickstarter. They hope to raise $80,000 to add original music, archival footage and post-production to the movie. The film is mostly ready, partially due to $105,698 in funding raised from a 2012 Kickstarter project. The most recent campaign closes Feb. 1 and has currently raised about $38,582, a bit less than half of its funding goal. "Today, NASA is promoting a 'Journey to Mars,'" representatives with the film's production company, Eventide Visuals, wrote on the movie's Kickstarter page. "They have nice graphics, and their PR team is doing a great job telling everyone how Orion is going to get to Mars in the 2030s. The reality is, there's no money for any of this. The Space Launch System is under funded, and cannot fly at any safe or continuous rate with the current NASA budget." The documentary also covers the history of NASA in terms of economics and politics. It includes interviews with NASA officials, former astronauts, representatives from private space companies, politicians and astrophysicist Neil deGrasse Tyson, among others. While the movie has heavy criticism for NASA's approach, the production company adds the agency does deserve praise for its successful exploration programs within the solar system. "We explore issues and we bring problems to light that always are not the most positive things to talk about," representatives with the film added. "But it's important to remember that NASA has been the only organization to send humans to the moon, or a rover to Mars, or do many of the exciting things that make up our space program today." The leader of the project is Paul Hildebrandt, a California-based entrepreneur who owns Eventide. Should the movie be completed as planned, it will be released in April or May. The project will still go forward even if this Kickstarter campaign is unsuccessful. Follow Elizabeth Howell @howellspace, Follow us @Spacedotcom, Facebook and Google+. Original article on Space.com.